These would go well with a mug of hot chocolate or coffee. They sound good. Didn't know it meant twice baked. Thanks Anthony for the clarification on pronouncing "Anise"! SUSANNE DRAZIC: Absolutely correct. Thanks, Kathy says hello. 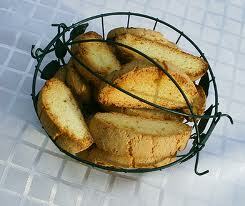 ALEX J CAVANAUGH: Delicious biscotti, from medieval Latin bis and coctus, meaning twice cooked. TORVIEWTORONTO: Delicious old-fashioned taste. a great cookie. Thanks for calling. DUNCAN D HORNE: Thanks Duncan, although sometimes, in British Isles, many words are pronounced differently than in USA. Even here some people say: aneese. Thanks for caling, best wishes to you and the girls. MY JOURNEY WITH CANDIDA: I know a lot of people who do not care for anise flavour, I personally love it, even have smoked anise-flavoured cigars and enjoyed them. I bet the twice-baked cookies of yours with vanilla are good too. PRATHIMA RAO: These cookies are unusual and delicious too. Thanks for calling. I've been pronouncing it wrong this whole time! Another recipe for festive food of the holiday. I too love dunking them. MANZANITA: I agree and you're right, they are perfect for dunking. Deliciosa combinação: amêndoas e anis. Saboroso e aromático. yum! These sound so scrummy! They look awesome. I can smell them now. I did not know what Biscotti meant until now. Learn something new every day! i have recently fallen in love with biscotti!! Your post reminded me that anise is the one spice my kitchen is missing. I like that you stuck to the older version of the recipe and used anise seed instead of extract and didn't use the drop method (which makes for a rather messy cookie). These sound really delicious. Anthony, these cookies with almond, brandy and the citrus factor must be great, no doubt about it! I loved the main ingredient, i.e., anise! Never tried anise while baking cookies. Sounds different and brilliant! I've never tried anise or biscotti!!! the ingredient list of this biscotti is amazing! what an amazing medley of flavors! Anise cookies would be perfect for an apero-- served with Pastis! Bookmarking this recipe! KALYAN P: Thank you, I agree. MAGIA DA INES:Oi amigo.Obrigado pela visita, fico feliz em ouvir que você gosta destes cookies.Desejo-vos dias felizes. LYNDA R YOUNG: Scrummy describes them perfectly. Thank you. STEPHEN TREMP: Thank you Stephen, I learn a lot from you too. LYNN PROCTOR: Now that's a romance to envy. JOYTI: Hi Joyti. I love anise, tarragon, fennel etc. Thank you for your kinds words. PURABI NAHA: They are great cookies, I hope you bake some soon. SAMANTHA VERANT: I bet you are near Provence. A gouter of Pastis with these biscotti sounds fabulous. Ooh la la. I'm a fan of anise flavor and these biscotti look amazingly good and crispy. MALLI DAS: Thanks, it's a good recipe. They sound really good, thank you for sharing. I often drink a cup of anise tea. MAGIA DA INES: Belated Feliz Pascoa! LINDA: These with anise tea sounds wonderful. Thanks for your visit. SUSAN OLOIER: Thanks for calling Susan, I know how busy you must be. My best to Zane. MAIL4ROSEY: These are quite delicious cookies. Thanks. Ha! I didn't realise biscotti means “twice cooked”. They sound yum. Anise cookies...I have never tried them, although I have tried biscotti before and loved the taste. Anthony, I loved this recipe. Thanks! Yummy cookies, looks so crispy. Delicious as always. wrote you a reply abput Kathy on my blog! Mmm that's one of my favorite flavors! Such great cookies!! Biscotti and strong, strong coffee. Sounds perfect, Anthony! This sounds nice. Reminds me of something in my country called rusks. Love these delicious anise flavored Biscotti. Delicious cookies!! These look wonderful - what a classic cookie! This is truly the classic biscotti (or contucci as we called it) that my entire family enjoyed growing up to this dry day Anthony! I live in SC now and there is a very famous little eatery here called "Grits and Groceries". Are you associated with it? I am trying to find your background on your blog. I'm glad to be one of your newest followers and hope to read some of your recipes again!